So, it’s been a few months since my first guide came out. Clearly, USJ has updated their site not long after my guide was out. A lot of you are still sending me emails, so I’m guessing there are still people looking for a guide. So, I’ve finally found time to update the guide! Here you go! Sidenote: Do note that this guide is not complete: I’m missing what happens after the transaction is completed. If anyone would like to give me a hand in this, please do send me screenshots if you are able to! Just email them to bloodprincess@live.com. Please do not send me the QR codes – they are private and meant for you only. First, go to http://www.usj.co.jp/ticket/. Note that this guide is only telling you HOW to purchase. Please already be sure of which passes you wish to purchase. 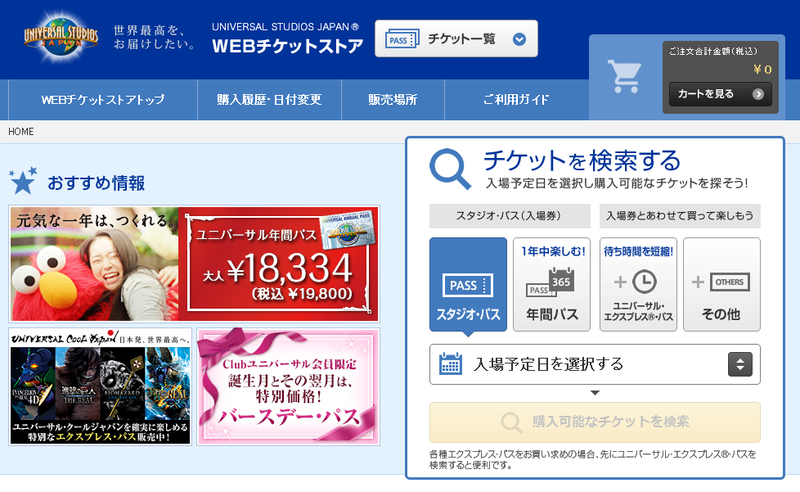 Information can be found on the English version of the USJ website on types of Express passes. Also, a short disclaimer here – the passes tend to change from time to time, so at the time of writing the passes may cost differently / have a different package from when you are reading this. At this point in time, the express pass allows you to purchase advance reservations to the Wizarding World of Harry Potter, as well as book a timeslot to take the ride. This cuts the queue down considerably, as when I went, the queue was 200 minutes long! No joke – the pass saved my life. Please read up on the different various passes before you decide which you want to purchase. If you’re confused, drop me a comment I’d try to help! To know how many people are going with you, and if they will need passes as well (Express Passes only allow 1 person to enter per pass, so you cannot share passes. Buying passes at 2 different dates may result in different entry times for Wizarding World of Harry Potter). Studio Passes are basically your entry tickets – they do not cover anything besides the entrance fee. They can be purchased both online as well as in Japan, however if you are purchasing Express Passes online, I would recommend you to get the Studio Passes as well. The reason being that you save the queuing for purchase at USJ, and also you save the hassle figuring out where you can go to purchase, and if there will be a language barrier. Express Passes are basically “jump queue” passes. There are various types of Express Passes, which gives you priority queuing in various types of rides. Each Express Pass is only valid for 1 use per ride stated, and is not tagged to anyone in particular. A staff will scan your QR code upon entry into the priority queue. Express Passes can also be bought at the park itself, but are usually pretty quick to sell out (I’ve heard Japanese queue way early in the morning to rush in for Express passes). The Express Pass can also save your queuing time, leaving you time to enjoy the other facilities. For example, a queue at HP Forbidden Journey ride took me less than 10 minutes (constant walking – the queue was not standstill at any point), while the normal queue was estimated at 200 minutes during my trip in April 2015. Also, if you are into the Harry Potter area, take note that USJ does warn tourists that if the area is too packed, they may restrict entrance. So if that’s your highlight, Express Pass is your answer. To find out more about Express Passes, you can read up on Express 3,5, 7 here (http://www.usj.co.jp/e/ticket/). Of course, there are more than just these options, but those are available in the Japanese version only. Most foreigners go with Express Pass 5 or 7, depending on the rides that you want to take. This is the main page you’ll purchase from. On the right you’d see the box with a magnifying glass icon. Below it are 4 boxes. These 4 boxes allow you to (in respective order), purchase Studio Pass, Annual Pass, Express Pass and Others. For simplicity sake, I am splitting this guide into 3 different parts – you will understand as you go along. But before we dive deep into the guide, first some simple explanations. Hi I will be traveling to Osaka this November 5-8th with my husband and 6yr old. May I know if I can just get 2 express passes for either one of me or my husband and one for my child? Can my husband and I go on the designated express pass rides interchangeably with my child? Meaning, for ride A, hubby and son will use express, then ride B my son and I will utilize the express pass. Kindly let me know if this is possible please? I do not wish to spend so much on 3 express passes and also entrance tickets. Thank you and greatly appreciate your help and advice! hi vee. the exchange pass is not tagged by name.. so you would be able to do that. but note that you would not be able to repeat rides.. i.e. you cant go on ride A if your husband has alrdy used the pass for that ride. hi.. what sort of information are you looking for? Hi, I can purchase the 1 day admission pass on 5 Feb but when i click and go to the express pass ticket also selected on 5 Feb. However, when i click the cart to check the again, the express pass how the date as 15 Jan, is that correct? probably not – please check your process again. you could have clicked something wrong! Hi Sara, never tried loppi machines. But based on what I remember i think Loppi tickets are not QR… they are the physical tickets I believe. Hi katherine usually you can screenshot it from the website and send it via email. or simply download the pdfs u printed from. Thank you so much Hinoki! yes i am sure i purchased my own with a non japanese card. it could be possible your bank blocks overseas transactions? have heard this occurs to a few people but most are OK.